The renewed popularity of natural stone tiles for use in residential or commercial properties is largely due to the affordability of the product. In past decades, stone tiles such as travertine and marble were very expensive to obtain. Today, direct importers acquire huge amounts of these products and distribute them to home improvement centers, construction companies, and flooring tile retailers. Stonexchange, a Miami-based manufacturer and importer of natural stone, offers some of the lowest prices on top-quality travertine, and we deliver throughout the state of Florida. One of the most popular styles of travertine is Arizona Ivory. Wholesale beige Arizona Ivory travertine is one of the most beautiful natural stone tiles sold for use as a floor surface, kitchen backsplash, or bathroom wall covering. This product is now available at drastically reduced prices, delivered direct to the customer from Stonexchange. Travertine has long been a favored building material. Although brittle in appearance and rather porous, this material is easily cut and shaped. Its rustic look makes it a popular choice for those wanting to achieve a truly authentic, tasteful atmosphere in the kitchen, living room, bath, or patio. Travertine is a form of natural limestone. It is created over thousands of years when water percolates through sedimentary layers of packed sand. The alkalis present in the water form a natural cement and also deliver contaminant particles to the sedimentary layer. These contaminants are what give the stone its unique appearance. Beige Arizona Ivory is a particularly gorgeous shade of travertine. The medium-light color of the stone is complemented by rosy pink, and the resulting tiles produced by the manufacturer are soft in appearance, lending a gentle glow to the indoor environment. This product is very popular among those who want a warm, inviting look and feel to the kitchen, bath, or living room. Travertine is cut from a rock formation using large cable saws, water jets, or huge circular blades. It is thinned down into sheets, cut into rectangular pieces, and packed for overseas shipment. Smaller pieces of travertine are tumbled in a rotating container, then filled and sealed. These pieces are used for mosaics and wall insets. Travertine will absorb water and contaminant particulates unless it is given a coat of sealant. 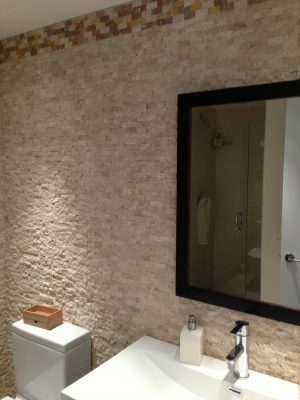 Buyers of this product are aware of the different grades of travertine tiles, some of which are suitable for indoor use. The highest quality tiles are those capable of withstanding high humidity, lots of foot traffic, or exposure to soot and smoke. Stonexchange offers commercial clients the opportunity purchase bulk quantities of beige Arizona Ivory at affordable wholesale prices. Because our company sells only to retailers and contractors, we can offer per-piece pricing that most competitors cannot match. We operate our own manufacturing facilities overseas, and we do not employ the services of middle-level brokers. This is good news for our customers, who obtain the finest quality Arizona Ivory travertine available at truly wholesale cost. Travertine tiles are usually cut into rectangular pieces that are 24″ X 36″ in size. These sheets are about 5/8-inch in diameter, have been honed and filled, and have been smoothed on the bottom side. Large wooden or plastic crates are packed with sheets of this material, loaded onto a container ship, and delivered to the Stonexchange warehouse facility in Miami. Installers will generally want to use tiles of this size because some of the applications require a large surface area to be covered with stone. Travertine is also rather easy to cut, and expert installers have no trouble producing smaller sizes to fit into tight areas or around the perimeter of the floor or wall. Retailers often need to keep a large inventory of travertine tiles on hand because contractors will buy as many as 200 sheets at a time. Matching color shades of floor tiles, window sills, and thresholds can be a nightmare if these products are bought from different suppliers. Stonexchange solves the problem of color matching because we import all of these products. We guarantee a consistent color shade because all of our products are manufactured from the same geologic formations of travertine. Stonexchange also carries a full line of mosaics and insets. These pieces are carefully crafted by experts who work at the manufacturing facility. Finding the right color match between tiles, thresholds, sills, and mosaics is never a problem when purchasing from our company. Travertine is quite heavy, making it extremely difficult to transport. In the days of the Roman Empire, only the most wealthy of citizens could afford to buy it. Many of today’s shipping companies charge not only by the size of the shipping container but also by total weight. We import vast quantities of travertine on a constant basis. Full container loads are less expensive to ship overseas, and our company passes this saving on to the client. Upon arrival in Miami, the crates of travertine are repacked if necessary for delivery to the customer, and the product is delivered by a reputable, local trucking company. The real savings enjoyed by the customer are the result of our full-crate minimum order policy. Instead of selling directly to the public, we offer our high-quality beige Arizona Ivory travertine to local flooring companies, construction companies and their subcontractors, and home improvement chain stores. These commercial clients are happy to obtain our product in bulk because they know that having exactly what their individual customers need is the most important aspect to maintaining a repeat business relationship. Because of the careful packing of travertine tiles into large delivery crates, we at Stonexchange can guarantee our customers a very high percentage of usable material. Industry norm is about seven percent breakage or other damage to tiles, but our customers know us for our attention to product quality. Although damage estimates are figured into the final cost of our products, this numerical amount is very small indeed. The standard-size travertine sheets mentioned earlier are not the only dimensions available. Many of the natural stone products imported by Stonexchange come in several different sizes, especially the windowsills, thresholds, and mosaics. However, we often do receive custom orders for non-standard product sizes. This is usually no problem because we operate our own manufacturing facility overseas. The expert cutters and fabricators who work at this production plant can take a custom order for tiles, sills, or thresholds and produce exactly what the customer requests. This process may involve a longer lead time, perhaps two months, but Stonexchange does not charge the customer extra for this service. Fortunately, beige Arizona Ivory travertine is fairly easy to cut and shape. Most contractors who need a large quantity of this material have experience cutting down the tiles into smaller pieces of varying dimensions and shapes. The important thing is to have a reliable source of travertine, and that is why our Miami-based distribution center is always full of product, 365 days a year. Travertine often looks its best as a wall or floor covering when complementary shades are used. In addition to the popular beige Arizona Ivory, we maintain a large inventory of medium shade tiles, sills, and mosaics. Darker noche shades are also available. Remember that different grades of travertine are used for different applications. We invite all interested parties to communicate with our sales and customer service staff concerning the different types of travertine material used for indoor/outdoor applications. Whether you are a retailer who would like to become a dealer of top-quality beige Arizona Ivory travertine, or a construction company wanting to buy direct from an importer, Stonexchange is the name to remember. Our reliable service and unmatched wholesale pricing on full-crate orders of beautifully manufactured travertine products makes us the premier distributor in the region. Feel free to contact us with any and all questions about product availability, pricing, and delivery schedules. Stonexchange is the place to visit for wholesale beige Arizona Ivory travertine in Miami.